ANTI CELLULITE MASSAGE OIL helps break down fat cells in those problem areas such as hips, thighs, buttocks and abdomen. Unlike cellulite cream it absorbs into the skin immediately and attacks those unwanted fat tissues. Detoxify-Our special formula is packed with Vitamin C and the powerful antioxidant natural oils that will help you to cleanse and decongest your lymphatic system, allowing you to feel your best! 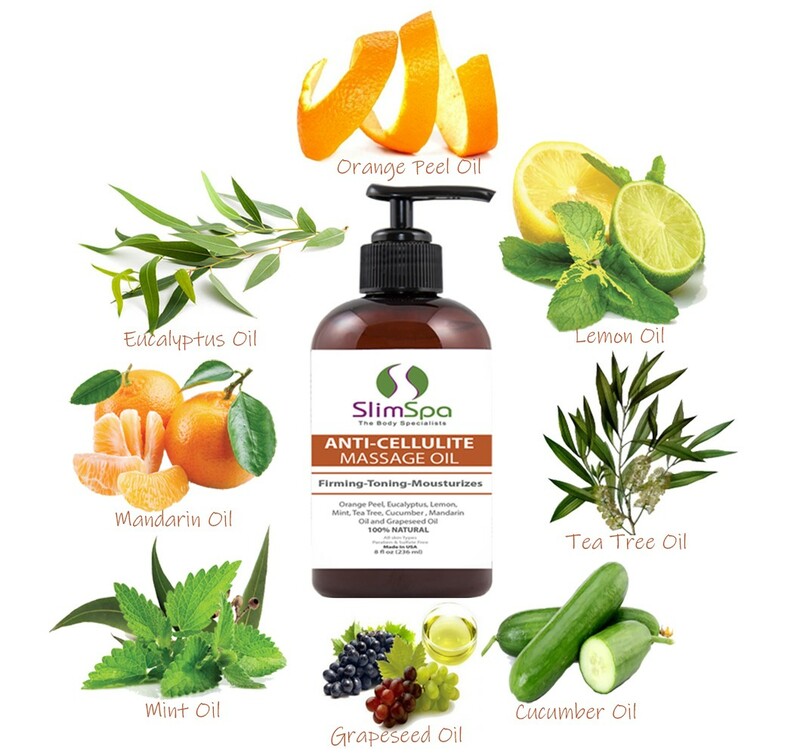 ALL NATURAL INGREDIENTS such as Orange Peel, Eucalyptus, Lemon, Mint, Tea Tree, Cucumber , Mandarin Oil and Grapeseed Oil work in concert to tackle unwanted fat tissues. Each component used in this cellulite oil play a key role to help the firming and tightening process. Our formula minimizes the look of cellulite—even stubborn cellulite. It also enhances the skin’s beauty and increases the appearance of firmness while nourishing, moisturizing, and enhancing the look of beautiful skin. 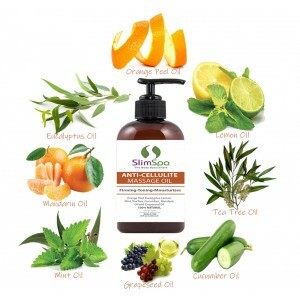 PRODUCT OF THE USA our natural cellulite remover oil is made using the Highest Quality Ingredients. This product not contain alcohol, parabens or sulfates and is Cruelty Free. Orangel Oil The abundance of vitamin c in Orange oil makes it a valuable oil for treating cellulite. It promotes the production of collagen, which in turn strengthens the hypodermal connective tissues to stop it from dimpling under the weight of fat cells. Orange Oil also boosts blood circulation. You will find the Orange Oil a helpful essential oil for wrinkles and stretch marks. After exposure to orange oil on cellulite dissolve fatty plaques, leave extra inches with problem areas. In addition, the orange oil is a good tonic and moisturizer, so the skin in problem areas of cellulite looks smoother, firmer and toned. So, orange oil acts on cellulite from the inside, burning fat, and outside, pulling and smoothing the skin. Anti-cellulite massage with orange oil is not by chance among the most ordered anti-cellulite treatments in beauty salons. During the massage increases blood circulation, begins to work actively exchange system, removes toxins, toxins and breaking down fats. In addition, massaging motion is divided fat cells that form cellulite. Lemon oil (or citrus limon) is commonly used to treat varicose veins because it helps improve circulation. Increasing or improving circulation strengthens tissues, helping to keep fatty tissue under the dermis. Extracted from the lemon rind and containing the medicinal compound limonene, lemon oil is a natural fat dissolver. Lemon essential oil is well-known as a toxin cleanser. It can help purify the skin and refresh your energy levels. It has powerful anti-microbial uses and can also improve neurological activity when inhaled. Mint oil detoxifies the body since it's a diuretic and is hence used for cellulite. It is a common ingredient in anti-cellulite massage oil blends and bath oils. It is also used in massages that treat flabby skin and stretch marks, which helps reduce cellulite. This oil boosts your metabolism and increases your blood circulation. Tea tree oil will help get rid of the orange peel to be rich in antibacterial substances, anti-inflammatory and regenerative. This oil reduces fluid retention, increases circulation and breaks up toxins stored in your body. Tea tree oil can help eliminate dry, dead skin cells that layer on top of the skin. As an antibacterial, antifungal, anti-inflammatory and antiseptic, tea tree oil helps to alleviate itching and control redness. It also helps to prevent inflammation, infection and scarring. Cucumber Oil: Studies indicate cucumber seed oil help the skin strengthen its lipid barrier, restoring proper moisture balance, smoothing the skins surface and improving skin elasticity. External application of the phytochemicals in cucumber tighten collagen to firm the skin’s outer layer, resulting in an instant reduction of the appearance of cellulite. Massage a cucumber oil into the thighs, buttocks, abdomen and anywhere else that has unsightly cellulite to get rid of it. Cucumber is made up of Vitamin C, which has anti-inflammatory properties and is soothing to the skin. Cucumbers oil fight the appearance of cellulite. Mandarin oil is good for the blood circulation and for the circulation of the lymph. This way, it keeps the skin rejuvenated. Mandarin oil helps new cells and tissues to grow and improve the stretch marks and cellulite. Mandarin oil is very mild and known for many healing properties. For instance, mandarin essential oil is useful in helping to reduce the appearance cellulite, brighten the skin, alleviate insomnia, reduce oily skin, diminish the appearance of scars and age spots and minimize stress and wrinkles. It also has cytophylactic properties and aids in restoring damaged tissues in the body.